I'd never baked normal maps out of ZBrush until this model: I've always baked them out of Maya because I heard that they came out so much better. I decided to try it this time because it seemed like it would save a lot of time. What I didn't account for was the learning curve of finding the right settings in ZBrush, so I ended up spending twice as long as I should have because I spent a long time fiddling with settings in ZBrush and actually ended up baking one set of maps from Maya in addition to those that I baked in ZBrush. I baked displacement maps and normal maps out of ZBrush. This was one of those days when nothing worked out as planned, but I managed satisfactory results in the end. 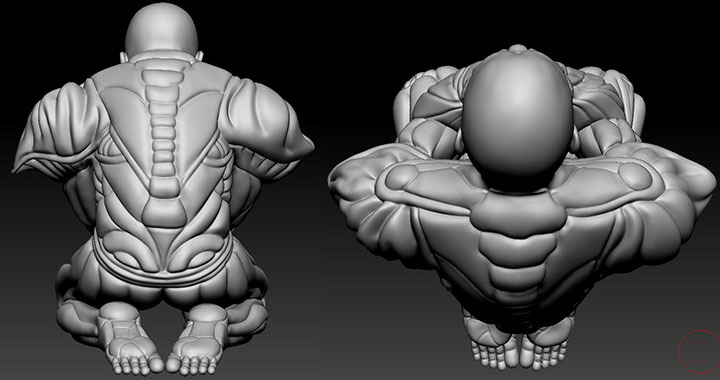 A lot of importing and exporting and a little sculpting today. In the form of a photo collage. I made a list of all of the remaining tasks to complete in the revision of my Juggler's textures this day. I submitted that reel because I realized that the submission guidelines prohibited having any contact information anywhere other than the first frame of the 10 second time span (I edited out that frame for posting on the internet). This is the reel that I created the first time around (and the way that I would have left it had I had free reign). This was the day that I began the reel-editing process. And the day that I discovered that the resolution requirements were full 1920 x 1080 HD and that I had to re-render a couple of my turntables. I spent this day trying to turn detail that I'd previously achieved through a normal map into detail achieved through a displacement map. It has far fewer polygons than the tire with the modeled tread, but I think that I should be able to create the same look of a tread by creating a displacement map with the tread pattern in it. And, finally, on the first/last day (depending on how you look at it) of Daily Art for this entry, I created a new, solid mesh to replace the very high-poly wire mesh in my Juggler's tea ball. I worked on the same thing two days in a row and never paused to take in-progress screen shots of it. So here is the finished image covering both days' worth of work. I didn't complete this entire storyboard in the two days that I worked on it. I actually began the thing a few years back, then lost interest in it in favor of other projects. It's been nestled in the back of my mind on my to-do list, however, and for some reason I really felt that it would be a valuable example to add to my Talent Development program application portfolio. Most of the work that I completed over the two day span was coloring the panels. All of the initial drawing and layout was already completed, and I had blocks of color multiplied over each panel depicting the dominant shade that I wanted each frame to be. 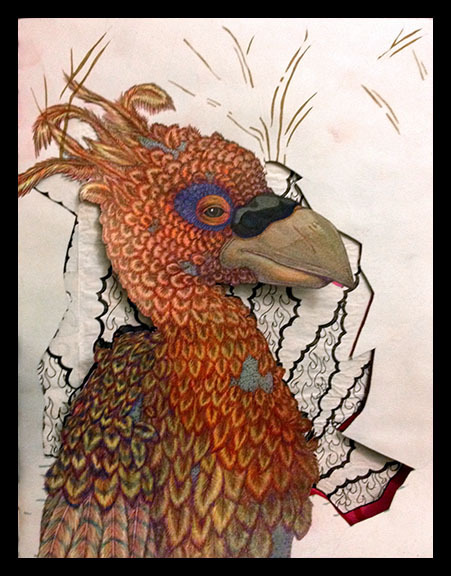 The work that I did over the weekend was pretty akin to coloring in a digital coloring book of my own creation. Saturday's work was just a quick sketch of a lion head. I found myself studying the contours of the face of a leopard whose photograph appears occasionally as my computer's desktop wallpaper and wanted to draw a new version of it. Changing the proportions of the face turned it distinctly lion-like, but, as I wasn't really aiming for any type of cat in particular, I was pleased with it. I'd like to turn this sketch into vector artwork in Illustrator someday. I've been UVing all of the Juggler's pieces separately because I started working on the character this way, but I know now that that was a mistake. Having a separate UV map for each piece of the character wastes space and makes the character far too data-heavy to function efficiently. I can't do much to fix all of the UVs on the objects that I've already added normal and texture maps to without re-doing an awful lot of work, but I can, and will, combine the UV maps of some of objects that have no texture information to them yet before I go about adding such information. I'm planning to dispense with the procedural textures that I gave the Juggler for my thesis and texture paint her in Mudbox instead. She will be a wonderful piece to add to my texture portfolio, which is distinctly lacking at the moment. My art on Thursday consisted solely of a quick little face-painted mask of-sorts. More practice for when I begin doing this at the farmer's market. Wednesday was the day that I truly revamped my demo reel. I fixed the little issues that I missed later in the week, but this was the day that I truly put effort into working on it. It's fairly similar to the reel that I've been using (it features many of the same models with the same turntables), but the turntables are re-ordered to showcase my best models first. I know that this is how a demo reel should go: you show your best work first so that the recruiter who views 100 demo reels per day becomes interested immediately and doesn't just turn your reel off thinking that everything on it must be as mediocre as the first thing and move on to the next reel. I know that's how it works, and yet... I've been using my thesis reel because I know that it has my best models on it. The problem is: I designed my thesis reel to work up to my best work because I knew that the panel that it was intended for was going to watch the entire thing and then discuss it. I saved the best for last, which is exactly opposite of what you should do when you create a demo reel. And somehow, until quite recently, I missed the error. I never revamped my thesis reel to make it more appropriate as a demo reel in any way other than changing the slate information to be more suited to its purpose; until now. The new reel puts my Addict first, followed by my newly-textured Gecko. Then comes the Juggler and the Warrior. Next is the Gallery environment. I nixed the still image of all of the models in the environment together because it no longer reflects the current state of the models now that the Gecko is textured; it also makes the addition of my Felix model tagged onto the end distinctly out-of place. This version of the reel includes the 8-bit Dragon for "Amazing Adventure" at the very end after Felix, but I nixed that turntable later in the week when I fixed the errors in the reel because I'm just not happy with the quality of the turntable that I created for that model. It's not lit properly, the speed isn't constant, there's no wireframe view... It just looks unprofessional compared to the rest of the reel. Felix doesn't have a wireframe turn either, but the quality of the turn-around that he does have is so far above the one that I quickly set up and rendered of the dragon that I'm still satisfied having him at the end. I spent the first three days of this round of daily art prepping my Szeth-Son-Son-Vallano model for 3D printing. I'm not planning to sell him or anything of that nature, but, after the artist who designed the character said such nice things about the model, I figured that it would be nice to have a physical representation of him. I might even try to send one to the artist and the author who created the character if I'm successful; I know that the author, at least, really appreciates fan art. Unfortunately, getting a model such as this ready for 3D printing is no easy feat. First off, The model has to be water-tight, which means one single, solid piece. When I built the model he consisted of exactly 15 different pieces. It also has to be under one million polygons, and the model that I built had something like 8 million quads if my memory serves me correctly. There is also a minimum thickness that any part of the model can be (how much that is depends on the material used to create the print), a minimum distance between two separate sections of the model (which means no intersecting or otherwise touching geometry), and a slew of other stipulations about the dimensions of the piece which will cause me less grief than the few that I have already mentioned. This means that I had to decimate the model to bring the poly-count down below one million while keeping all of my sculpted detail, and then connect all of the different pieces and any piece of geometry currently touching any other (this includes connecting the fingers resting on the surface of the model's face to the face as well as attaching the wrists to the sleeves and the coat to the shirt and the pants to the belt and every other piece to all of the other pieces). The above image illustrates where I've deleted geometry from both the shirt and the belt in the areas that it overlaps. 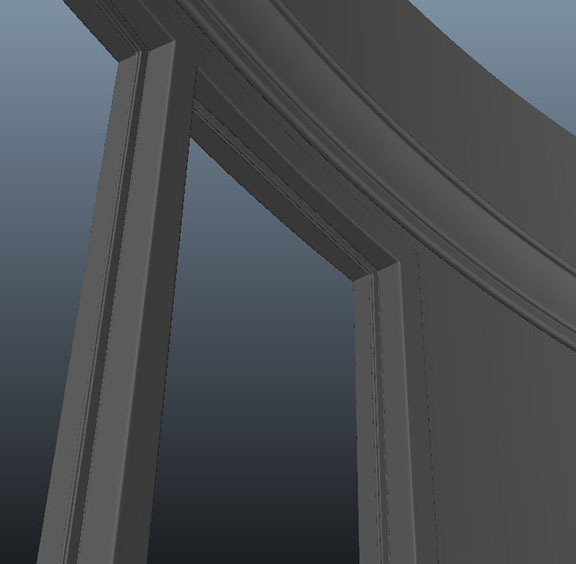 Next I will connect the vertices to make it water-tight. 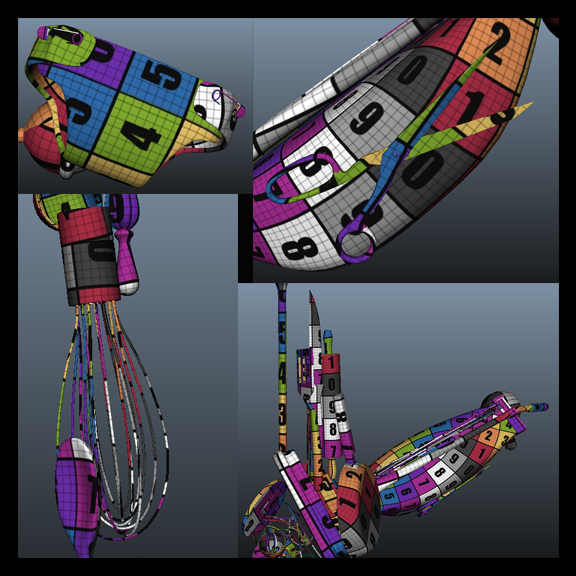 This image clearly illustrates why the model will require extra sculpting in ZBrush to clean up the newly-created seams between the previously separate items. The first day that I worked on Szeth I began by connecting his shoes to his feet. That's all that I did last week. 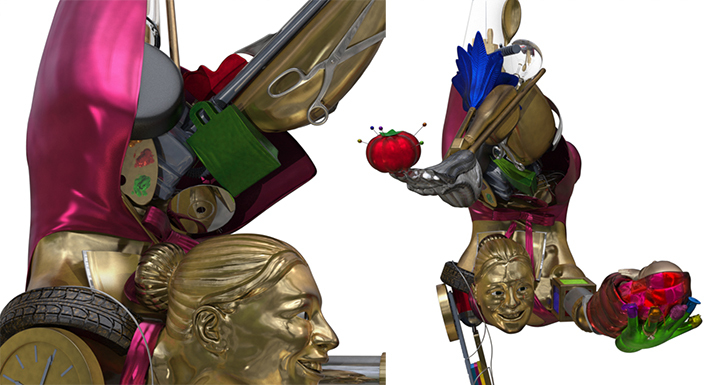 The coming week should be very heavily Juggler-oriented, as I'm trying to create all-new textures for her in the hopes of submitting her for consideration in the Academy of Art's Spring Show. 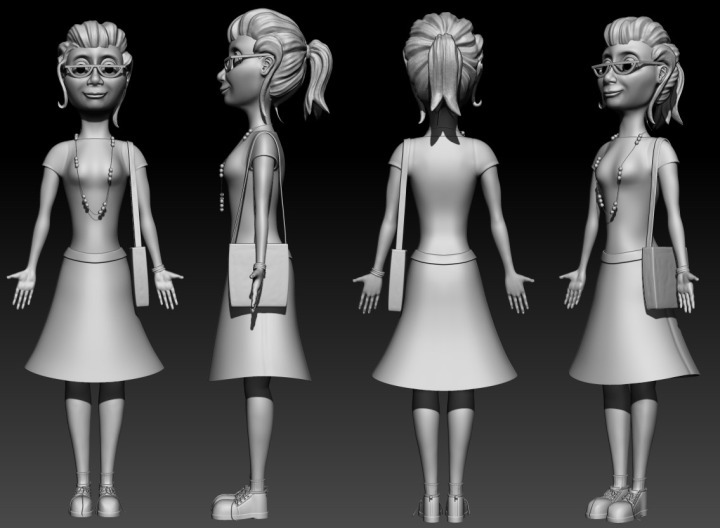 I think she'd be a fine fit for the Hard-Surface Model category. My final thesis video presented at my final review on Nov. 27, 2013. I passed my final review!!! I presented my thesis to four reviewers and they all said that they were impressed, which was really nice to hear. They complimented me on designing a project that has a very good mix of hard surface and organic modeling elements and making it unique. I told them that I was planning to continue the project by texturing the untextured models for my demo reel and they agreed that that was a good idea. They said that the Addict was my best model and the Gecko second to it. They recommended that I go back and paint some more of the Juggler's textures by hand instead of using mainly procedurals, which I agree with emphatically. I've been wanting to do that, as well as adding some more bump and normal map graphics to some of the objects on her, but I knew once I got her to the point that she is at now that I had to stop working on her, call her "good enough" and move on if I was to have any hope of finishing the rest of the project to the standard that I desired. Their strongest criticism was that the Juggler still looks a bit too CG. They also recommended that I update my reel, because the models in what I dubbed "my reel" are all a bit dated, but, since I'm planning to basically use my thesis reel with a few minor tweaks as my demo reel, that's not something that I'm overly concerned about. Finishing up the last minute changes to my reel and book, revising the book to turn it into a presentation format, and presenting my thesis was the bulk of the work that I completed in week 12. For week 13 I'm taking a break from my "Fearless" project and working on a model for a friend who will be presenting his animation thesis next semester. It's a pretty simple model (an 8-bit style princess), but it's taking a little while to build due to the fact that I'm working on my laptop rather than my PC, which is currently the more powerful of my two computers. My Mac doesn't have a whole lot of space left on it because it's an older computer, so my Maya is running quite a bit slower than I've become accustomed to. I've spent part of the day transferring unnecessary files to my portable hard drive, so I'm hoping that that will give my computer a little more power to speed things up, because it's tedious to select something and wait, and then move something and wait, and then select something else and wait again while trying to model. I'll post some progress pictures next week when I'm a bit closer to being done with her. 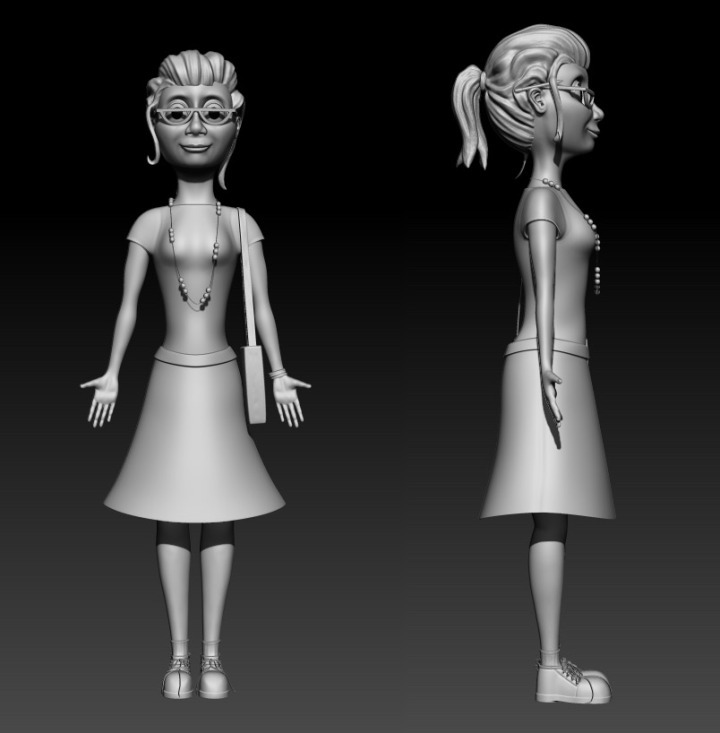 Then, after she's done, I'll return to texturing my thesis models. I probably won't get very far into texturing before I take another break for the holidays, but I do expect to make at least a little progress since I'll need some kind of work to show for my last week of school. It's official: I have a date for my final review: November 27th. The day before Thanksgiving. This means that I'm either going to have a spectacular or a really bad holiday (hopefully the former). This also means that I have until the 13th of November to finish my thesis and presentation. This isn't the greatest news since I discovered this week that my gallery takes 40-45 minutes per frame to render, but it's also fantastic news given that it provides me with the extra week that I knew I'd need past the earliest possible deadline that I could have had. Ok, so that kind of statement may be a bit over-dramatic, but it feels right. I only got my date on Friday, so as far as I knew for most of the week I had the potential for having to turn my entire thesis and presentation in on Monday, November 4th (the day that I'm writing this, as it happens) and there was no way that I could finish everything by then with the renders taking that long. I did the math and discovered that I would need over four straight days and nights of rendering to finish just the essential frames that I needed for my thesis. And I still needed to finish sculpting, normal-mapping, and rendering my Warrior. Not to mention compositing my whole reel and finishing all of my presentation materials - which would require additional beauty shot renders. Thankfully, I have two computers that I can work on (which is how I'm currently rendering gallery frames while typing up this journal entry), but only one has enough RAM to render from Modo in a manageable time-frame (the 45 minute renders on my PC took over 3 hours each on my much older Mac laptop) or handle models with over 10 million polygons in ZBrush. I can work on my presentation materials and directed study journals on my laptop, but the most crucial and time-consuming elements of my thesis all require the same computer to function efficiently, and 4 straight days of rendering did not fit the schedule. I'm waiting for opinions from this week's critique to make my decision fully. I'm rendering both passes with each frame (it doesn't seem to change the render time to have two passes instead of just one) so I have until I finish all of the renders and start compositing my fly-through to make my decision. I'm quite happy with him. I think that the pose came out really well and I think that the surface texture really looks like it could be chiseled wood. 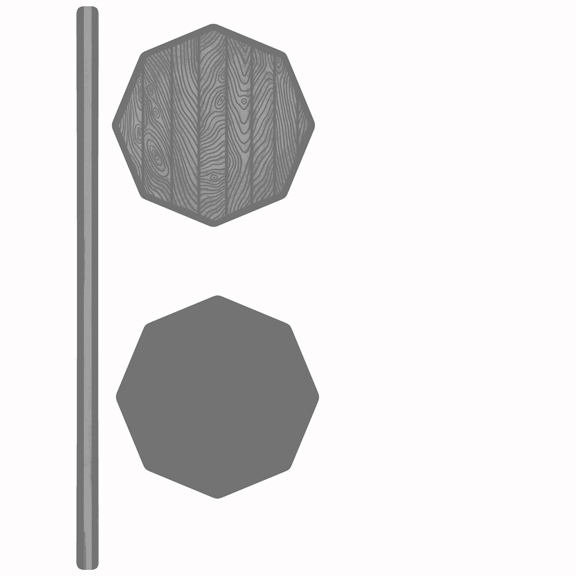 I'm especially happy with the rake-tool details; they're the kind of marks that I noticed all over the real wood sculptures that I was using as reference. Now I'm just hoping that the normal maps that I need to bake in the next day or two capture the detail on him properly. 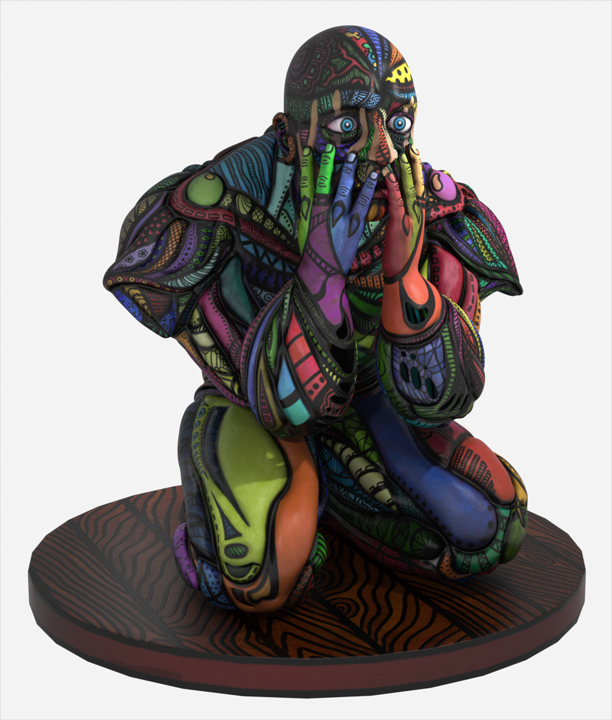 In the seventh week of the last semester of my graduate school career I made a few adjustments to my gallery scene and continued building and sculpting my Warrior. First, I changed the proportions of a couple of items in the reading nook of my gallery environment according to critique that I received from Tareq last week: I revised the couches in the reading nook by making the back cushions thinner and their overall height a bit shorter; then I enlarged the table between the two couches slightly so that it was a little more proportional to its surroundings. I also spent the week UVing and baking normal maps for the sculpted gallery pieces, but I haven't gotten them into Modo so that I can get images of the items with the normal maps on them yet. (I'm stuck on arranging wood pieces in the fireplace because I foolishly laid all of those out before UVing the initial model, and the fire log's one of the few pieces in the gallery that I've sculpted and normal-mapped, so it needs UVs...) Once I get that done, however, I expect the gallery to be finished quite quickly. The next thing that I did was to continue work on my Warrior character model. He now has a sword, scabbard, and helmet to go with the other pieces that I modeled for him previously, and he is also now UVed and sculpted about as far as I can go before breaking symmetry. I'm almost ready to pose him and then finish sculpting things like an actual facial expression and folds on his cloak before moving on to sculpting a wood-like surface-texture on him. I intend to give him some knots and gnarls and nicks of the type that might be left by a chisel or carving knife. Basically, I'm going to rough him up and make him look more organic - more like a wooden sculpture rather than a pristine 3D model. As far as the state that he's in now: I know that his muscle lines are quite strong at the moment - I will remedy that later (there's actually a method to my madness on that). Also, the many places where the geometry of his armor is intersecting his body and other pieces of the outfit are intentional as well. He's supposed to be carved all from one large piece of wood, so I figured that things like the helmet and greaves and whatnot would be carved right onto the surface of his body rather than clearly delineated as separate pieces the way that they would if he were supposed to be a more realistic character. I just wasn't mad enough to try to model and sculpt them all as one piece... There is also an unsculpted ear in one of the head-shots which I have no intention of detailing: I originally modeled the character's base mesh with an ear, and then when I was modeling the helmet it occurred to me that you will never see that ear. The helmet's supposed to be built onto his head, so it's never coming off. Hence, I actually removed the ear from the mesh to cut out the extra polygons when I UVed the character, but when I projected the sculpted detail back onto the UVed mesh it of course transferred the appearance of an ear back onto the head. I have actually smoothed that section out a bit since I took these screen shots, but I have no intention of making any further efforts to remove it completely. So, in the end: yes, there are unsculpted ears on the high-res character, but I'm leaving them alone because they'll never be visible. At the start of my fourth week of directed study I was concerned that my character's body had lost much of the volume that I had sculpted into the high resolution mesh. I had particularly noticed it in the shapes going down the character's back: according to my character design, you're supposed to be able to see those shapes puff out from the back a bit, but the back was nearly a flat curve. I had checked to be sure that the second subdivision level mesh that I exported from ZBrush retained volume in the shoulder area and detail in the face and fingertips, but I hadn't ever had an issue with a character's back, so I didn't think to check it. It was, however, a problem that was bugging me greatly - and one that I couldn't figure out how to fix without having to bake out all new normal maps and re-do all of the texture painting I'd done. The problem was: I had changed the Uvs after choosing the second subdivision level of the ZBrush model to export as my low-res mesh to apply the normal map (created from the high-res mesh) to; therefore, I couldn't just export a higher resolution model that would hold the sculpted volume better and apply the same texture maps that I had created to it because the UVs wouldn't match up. Then I had an epiphany: I could project the high-res detail from the ZBrush sculpt onto a subdivided version of the current mesh that I was using that matched the texture maps. Then I would end up with a mesh that had all of the subdivision levels, detail, and volume of the ZBrush sculpt, but with the same UVs that I had been using to build my texture maps. I even discovered that my current normal map functioned just as well when applied to the higher-res mesh as it did whern applied to the low-res one; I didn't have to bake a new one! As I mentioned in my last post, I had spent a day painting the texture map that you see on the character above. I had nearly all of the precise linework done. I figured that would be the most time consuming part of the process. I know that one can spend a very long time doodling; I've spent hours filling up a single page with doodles in the past. Key word: "hours", not "days"... Turns out, days is what it takes to doodle textures on a character like this. In fact, it takes the better part of a week working straight through with breaks only for necessities like eating and sleeping. I was blown away. I know that I have a tendency of underestimating how long projects will take me, but this was ridiculous... I had reference. I knew that it took me a day for the precise stuff and that doodling isn't that precise and therefore should require less time. I knew how long I'd spent doodling on paper in the past... I didn't realize that doodling on the computer with my tablet would be as different as it was. Now, you may be wondering why I'm so excited about the bottom of a foot (or, more accurately, since the character's on his knees, the top of a foot). What I'm most excited about, aside from the areas where the raw plaster sections transition into the painted portion of the model (which I think look very realistic, on the pink and orange toes especially), is that this is the first example of any work that I've done in Mudbox. That's right: I finally got around to trying it. I've been telling myself that I'll learn it eventually, whenever I finally work on a project that actually requires it, but I've produced surprisingly few textured models in my time at the Academy. 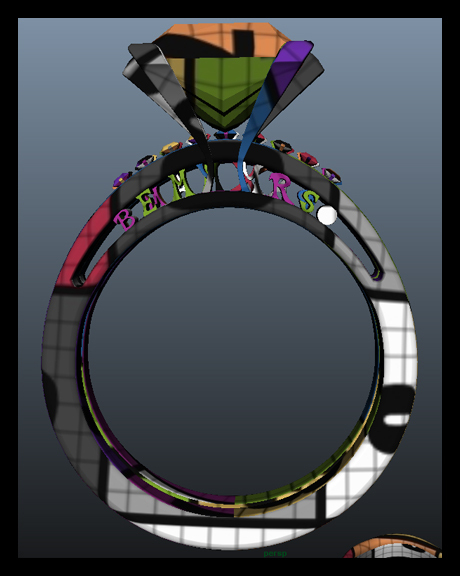 I'm working on a "modeling" degree, not a "texturing" one, so I guess it makes a certain amount of sense, but, still, I'd have liked to have done more texturing in my time here. Anyway, back from my tangent: I had very visible UV seams showing up in this area where each toe meets the main body of the foot: the division line between the white plaster and black painted areas of each digit were uneven at those points. So, I took the model into Mudbox and painted out the seams. I'm very happy with the results. I know it's not an extravagant use of the program, but it's not bad for using a program for the first time with no training, if I do say so myself! I have since fixed the faceting on the base by setting it to render at a higher subdivision level. In fact, the image of the base by itself above was my test of the higher subdivision render, and is what it will look like in the final turntable. Once that render finishes, I will move on to rendering the wirframe and flat-shaded versions of this model, then I'll start rendering my Juggler. In the meantime, I'm also going to work on my gallery models in the coming week; I'm really excited about building the fretwork ceiling and the crazy light fixtures. I'll be working during the day and rendering at night - here's hoping that after this month is over my computer and I will both get a break for a little while, because, until then, it's work, work, WORK! At the beginning of my third week of directed study I took a day off from sculpting my Addict and worked on building my Gallery structure. I built the walls as panels that I could duplicate around the room, but I had a bit of an issue with the curvature of the round room. If I built the walls at a low resolution as I originally planned, the shape of the room would still be perfectly round everywhere once I welded the panels together and smoothed them except at the windows, where I was forced to put in extra edge loops to fit the window frames into the panels. The portions of the wall with the windows would have lost their perfect roundness and instead become slightly faceted as the extra edge loops held the geometry in place rather than letting it spread out evenly in perfect roundness. I was concerned that if this happened you would see the unevenness in the way the light hit the walls near the windows, even from fairly far away as my renders of the gallery will be. I spent quite a bit of time building the walls and windows: making the flat glass window panels fit into window frames on curved walls, modeling the trim around the window that holds the glass into place, making sure that the different panel pieces connect correctly... In the end, I wound up with five different window/wall panels to duplicate in various positions around the room: One blank wall piece, one full window piece, one wall piece with trim to finish off a window frame on the right, one wall piece with the trim to finish off a window frame to the left, and one wall with trim to finish window frames on both sides. You see, each window panel ends in the middle of the trim so that, when the windows connect, there's no wall area between them. This, of course, means that when a bank of windows ends the next wall panel needs half the width of trim on the edge to finish off the window next to it. Hence: five panels. The last thing that I did in my gallery was block in the columns and major furnishings. This process actually caused me to resize and slightly reproportion my room when I discovered how little room I had left for the reading nook. The way I see it, your average couch is probably around five feet in length; when I made my couches that long they took up very nearly the entire floor space of the reading nook, leaving no space to actually access the bookshelves. So, I thought again. I moved the five-foot couch place-holders over to the reading nook area of the floor plan, then resized the floor plan image plane to fit them, leaving enough room to walk around and between the couches to navigate the nook area. Then I scaled the walls up evenly to fit the newly resized floor plan. I then scaled the height of the walls back down so that my ceilings weren't ridiculously high. In a room this grand, I do want high ceilings, but not completely, outrageously high. I've decided on an eight inch crown molding at nine feet with the actual ceiling topping out at twelve feet. I've been in houses with nine foot ceilings before and they're really nice, but I think that in a forty-five foot in diameter room (which is what the gallery turned out to be after resizing for the nook) they'd make the space feel just a little bit claustrophobic; so I settled on twelve foot ceilings. I then spaced out place holders for the columns and bookcases surrounding the reading nook, and that was the end of my work for the day. I was concerned that I was going to get a lot of problem areas in the normal map where the geometry of one part of the body pressed against the geometry of another part in the pose that he's in (i.e. : the fingertips pressing against the face, the back of the thighs pressing against the calves, the inner elbows pressing against themselves), but, surprisingly, I had very few issues. I did end up separating out some pieces of the high- and low-res meshes and re-baking normal maps for certain areas (such as the face) and compositing the new maps into the the full body one, but I didn't have to do this for nearly as many pieces as I expected to: most of the anomalies in the map were able to be fixed with just a bit of healing brush application in Photoshop. Then I started work on the color map. 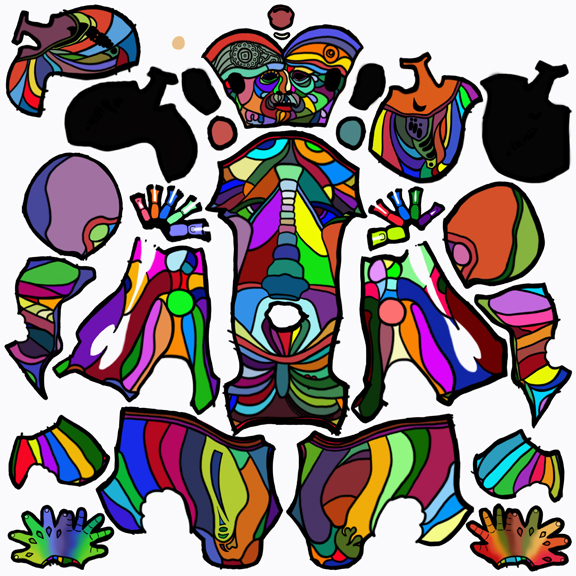 I figured that it would take another day or so to complete the designs in the color section on his body. After all, the designs are just doodling - most of the precise work was done. I thought that the sculpting of this model would be a "piece of cake" because nearly the entire thing was just refining the lines that I initially blocked in, but it was actually surprisingly difficult to get the defined areas to look right. I added volume to many sections that looked fantastic from the angle that I was primarily working from, then, when I turned the model, I'd notice that from another angle parts of the section would look flat or, worse, bumpy. When that happened I'd have to spend quite a bit of time inflating and smoothing, all the while going back and forth between subdivision levels to smooth and then check the progress. I don't think I've ever switched between subdivision levels as much as I had to while working on this model. I though that the smoothness of the shapes in this model would make it easier to sculpt, but it actually made it more difficult by leaving very little room for error. It almost had the feel of trying to organically sculpt a hard-surface piece, if that makes any sense. Well, I'm in the home stretch: the first week of my final semester has passed (and, boy, do I have a lot of work still to do...). I learned a lot creating this model; it was much more complex than anything I've ever modeled before. 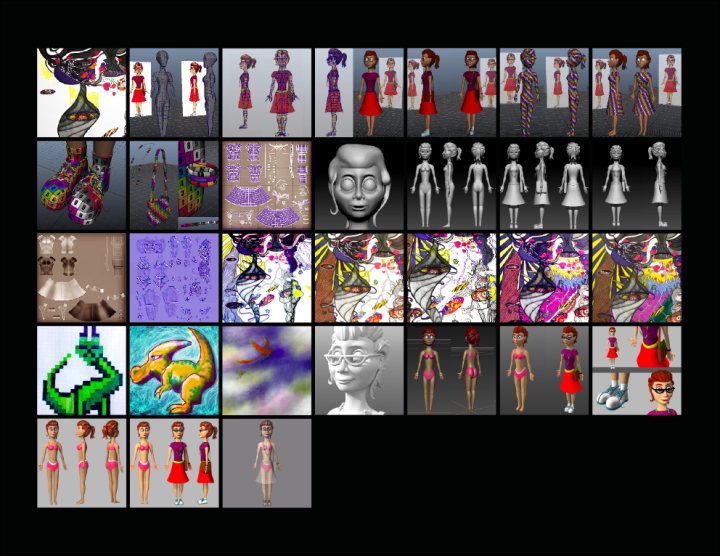 When I planned my thesis schedule I'd only ever made character models that were one to ten pieces depending on whether they had mechanical parts or clothing or just one solid body. 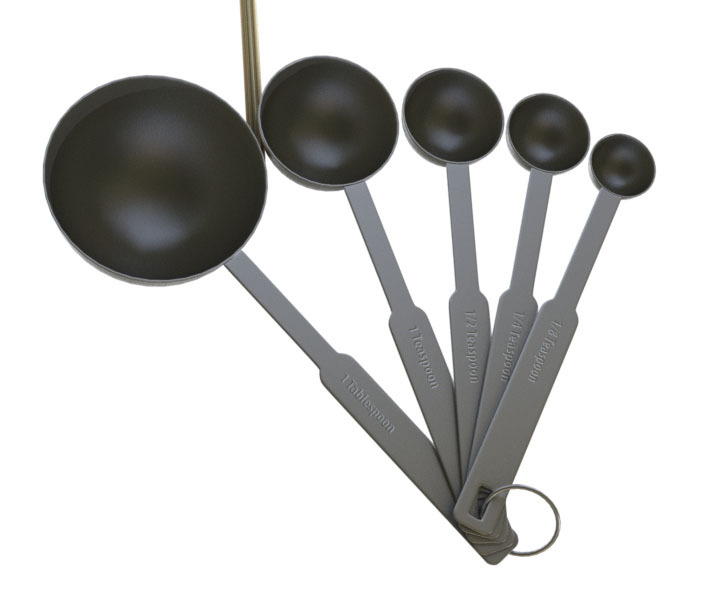 I'd never made anything composed of 60 different objects, many of which are made up of multiple pieces themselves. I had no idea of the scope of what I was taking on when I signed up for this, but I am thoroughly pleased with the results. I actually had a lot of technical difficulties while on my vacation, so the vast majority of the final work on this model was done after I returned home. I had quite a bit of trouble baking out usable normal maps of all of my ZBrush sculpting on the more organic objects, but I eventually figured out how to remedy that by compositing multiple maps of the same object baked with different envelope sizes together and using healing brushes in Photoshop. I spent a lot of time baking those maps in Maya and more time compositing them, but eventually I was able to move on and bring everything into Modo, which was where my real trouble began. I had too many textures. Too many normal maps, too many color maps, too many reflections to be calculated on too many different pieces: Modo didn't want to handle my scene. 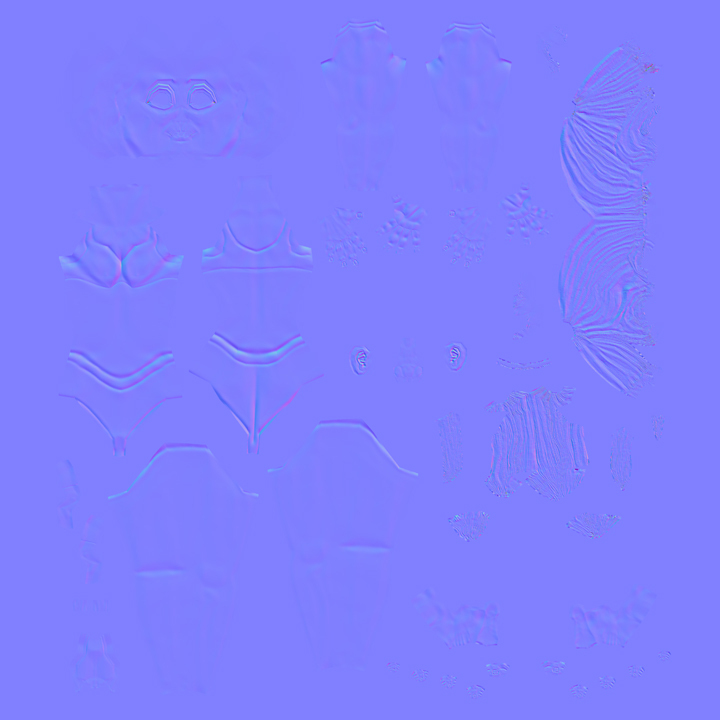 The real-time render preview kept freezing and crashing the program. 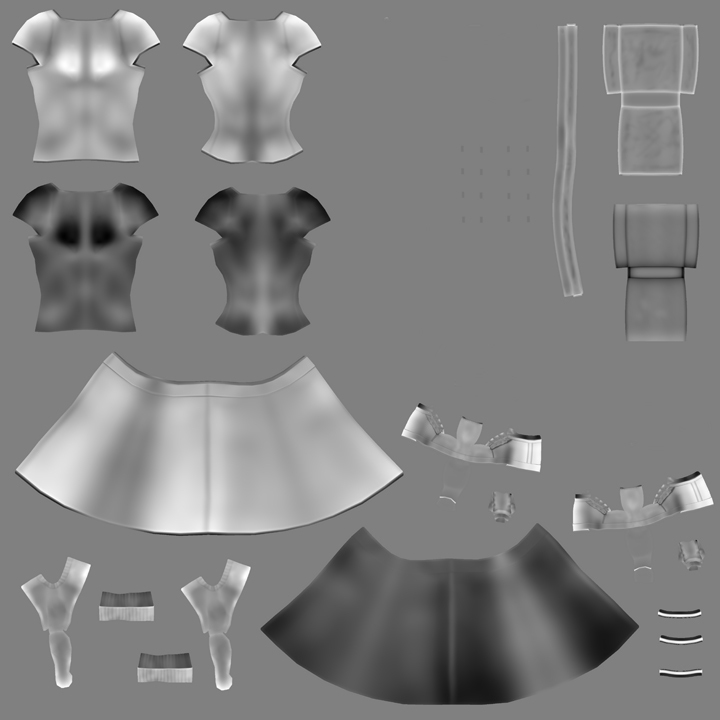 I eventually figured out a way to work in which I hid the textures on every object except the limb or even just the individual piece that I was working on; then I was able to make some progress. Some of the noise masks in the above images are still a bit extreme - you can tell that they're noise rather than grime - but I toned them down after seeing these renders. I haven't made new renders yet because it's a bit more of an ordeal to go through to set the renders up than I'd like to deal with right now. I have to open the file in the "modeling" tab which doesn't have the render preview screen built in, turn off all of the textures (which I've put into groups by body area to make the process easier), switch to the "render" tab and position my camera in the render preview window, switch back to the modeling tab, and then go straight to the final "render" from the drop-down menu without seeing the textured preview first. Then, if I need to change views I turn all the textures off and do it all again. It's the only way it works. My computer is good, but it doesn't contain enough ram to let Modo calculate this textured model moving in the preview render screen. I've just got too much going on in it. The final renders, however, calculate much faster than I expected them to given how much trouble I'm having with the preview renders. Overall, I'm happy with my Juggler. There are still a few things about her that I would like to tweak: I'd like to add some bump maps of etched designs on quite a few of the objects that make her up. I might change a few colors around. I don't think her head is holding its normal map quite as well as I would like: she lost a little bit of volume from what's there in my actual ZBrush sculpt. The apron has a similar problem: I sculpted wrinkles in the fabric that just aren't showing up as much as I'd like with that pink metal texture. I think that my "grime" masks made her just the tiniest bit too dark for what I'd prefer... But these are little things. I think it's important for me to move on now and finish the rest of my thesis. If I can come back and fix them later after I finish the rest: fantastic, but I can't deal with it now. She's 95% to where I want her to be; it's time to call it "good enough" and bring the rest of my project to completion. I could have as long as a month left in the semester after I present my thesis project - I can tweak the little things then. I'm going to progress on the theory that that's not the case, however, and hope that I can just move on from here and get this character sculpted and begun texturing within the week. I don't see anything particularly wrong with the mesh, just things that are different from the previous version, and I know that I tweaked the previous version quite a bit to get the posture right, so it concerns me if that work failed to follow through to the revised character. I think it's ok though: from what I can see now he still looks right to me, so I'm going to continue sculpting him and just make sure that I keep a close eye on his overall shape. Hopefully, when I post in another week, he'll be nearly done. My Group Directed Study session on Tuesday was my last class for the summer semester. In fact, I'm posting this blog entry early because I'm going on vacation soon. (Yay!) I feel that it will be necessary to continue working a bit during my vacation, but I don't believe that it will be necessary to concern myself with keeping up these blog entries during that time, as most of the work that I will be doing won't be visually impressive anyway. I plan to use the time to bake normal maps and UV anything that I previously neglected, etc. I won't be doing any ZBrush work because I'll be using my laptop, which doesn't handle ZBrush nearly as well as my desktop PC. So everything I do will be in either Maya, Modo, or Photoshop. You may have noticed that these two collages show two different babies. The first image is the first bit of work that I did that I brought into my GDS class on Tuesday. I was pretty happy with it, but not entirely confident that it was truly baby-ish. I hadn't done any real work on the baby's hand or elbow yet in that set of images: just the face. The comments that I got on it seemed to concur that it wasn't really quite there yet. My instructor pointed out that some features were too defined for a baby. One of my classmates suggested widening the forehead. I think there was a consensus that it needed to be a bit more pudgy all around. 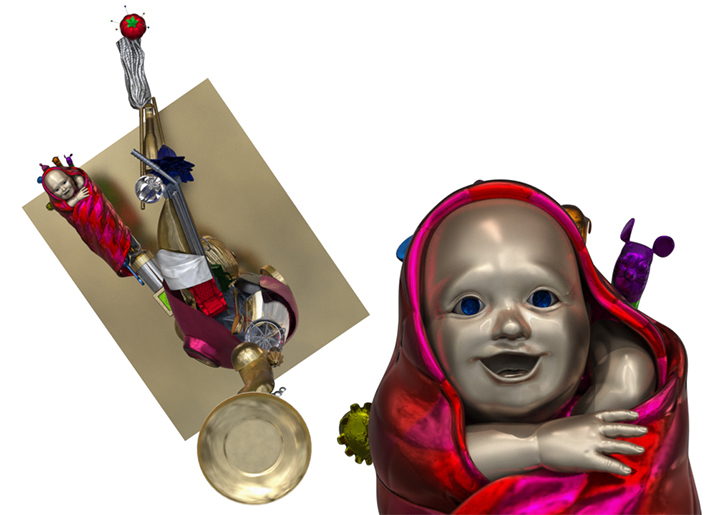 So, I went back to the drawing board and came up with the baby in collage #2. The baby in this image has been changed quite a bit from the first one: the hand is refined, the elbow is refined and resized, the blanket has been refined quite a bit more than in the first image (though it still has quite a bit of work still in need of doing on it), and, of course, the face has been changed. I started out by softening all of the features, which changed the expression and made it much more vague. I think that it looks a bit more authentically "baby", but I'm not sure that I like it any better than the first baby. I think that this rendition of the baby lost the character that the first incarnation possessed. The first one seems to me to be something like a caricature of a baby, while the second one is a bit closer to looking like the real thing. It's possible that I like the caricature better. I like the personality that first baby had: something was certainly making him happy. I'm really not sure what the new one's feeling. I wanted it to retain the happiness of the first in the second, but I really couldn't get that to work while softening the features enough to look more like the images of the newborns that I was able to find for reference online. I think that my main problem is that newborns don't actually have much expression in the real world. The images that I was copying from were either of babies asleep or in the middle of half of a yawn or just making shapes with their mouths. There's no real expression to their faces yet at that age, and I don't really want to look at older references since my baby is still in swaddling and I intend to keep it that way. I'm thinking that my next step is to find a middle ground. I'm going to try tweaking the new baby face to give it a happier and sillier expression. If it ends up getting defined again while making the changes then I may just say "so be it" and run with it. It's a sculpture. It's not supposed to be a real baby. It's a sculpture of a baby. As long as it comes across as "baby" I think I'm fine. It's not like when I was sculpting the Gecko's hand, which was supposed to be a metal object cast from the artist's actual hand. There's no way to cast a mold of a baby. It would have to be someone's interpretation, and since I want the sculpture to have a bit of a sense of whimsy to it, I think that a baby caricature will be just fine. I'm going to try to keep moving forward rather than just reverting back to the first baby face that I created. There are good things about the second head: it just needs more expression. I'll work with it more tomorrow before I leave for my vacation and hopefully leave it at a point that I'm happier with than I am now. If all goes as planned, I should have a lot of good work to show in three or four weeks when I get back to posting after my vacation. I can't wait to show my progress then. I'm quite happy with how it's turning out. 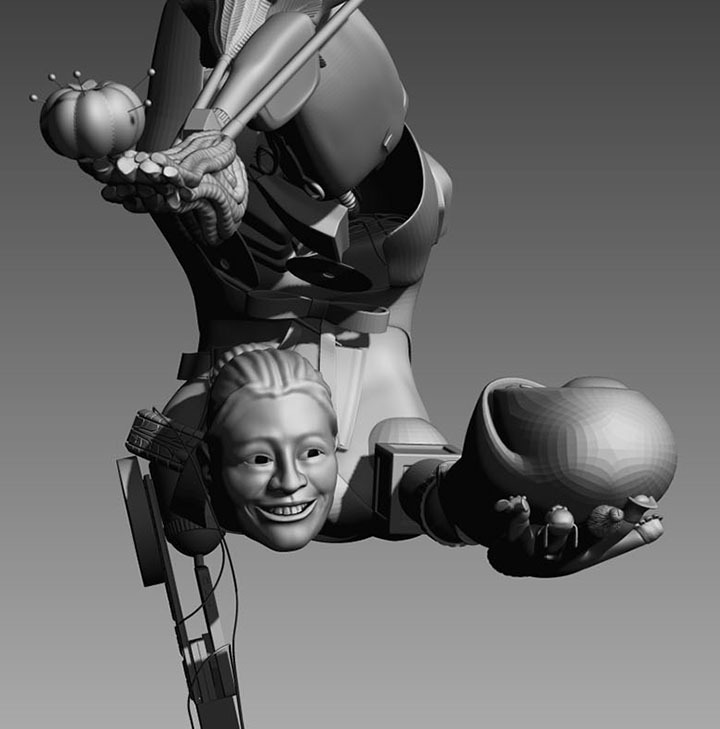 I'm going to leave the head as is for the moment, with certain elements still in need of detailing, and try to get the model of the baby that the Juggler is holding to at least this level of refinement by Tuesday when I have my last GDS class of the summer. (Actually, I hope to get a lot further than that, but we'll see how it goes: everything always seems to take me longer than I want it to.) Wish me luck! I'm getting this update posted quite late this week, so I'm including three Directed Study sessions in this report rather than the usual two. 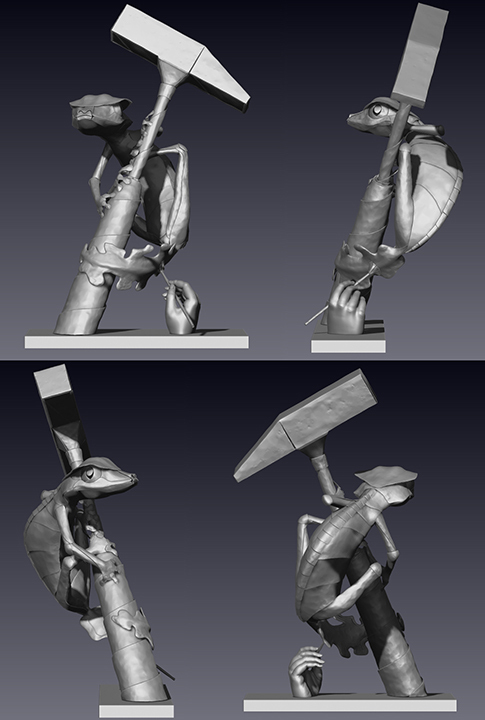 My Gecko is now COMPLETELY finished as far as my thesis work on him is concerned. I would still like to see him textured one of these days, but, as that's not part of my thesis, that will not happen for awhile. I bumped up the contrast just a bit for these images so that they were more visible, but this is the gist of the surface detail on the Gecko (top) and the base (bottom). That mottling on the blue is exactly the kind of coloring that I want. The material and rendering are obviously not at all accurate in this image, but, comparing it to the image with the flat colors that I rendered out of Modo, this is more like what I had in mind when I drew my character design. 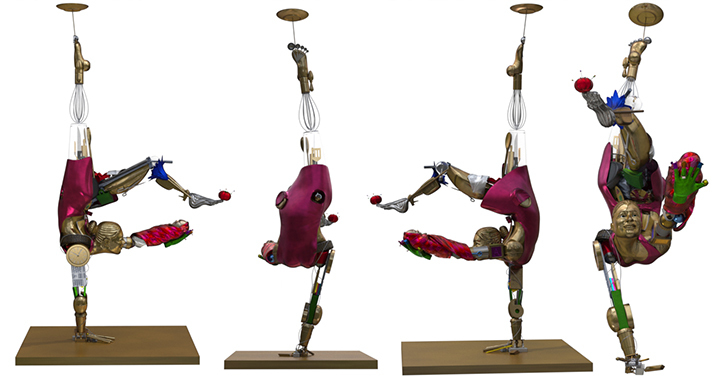 Then I moved on to my Juggler model. As with Sessions 9 and 10, there's really no clear division between my thesis progress between sessions 12 and 13, so I'm just going to combine them together here. 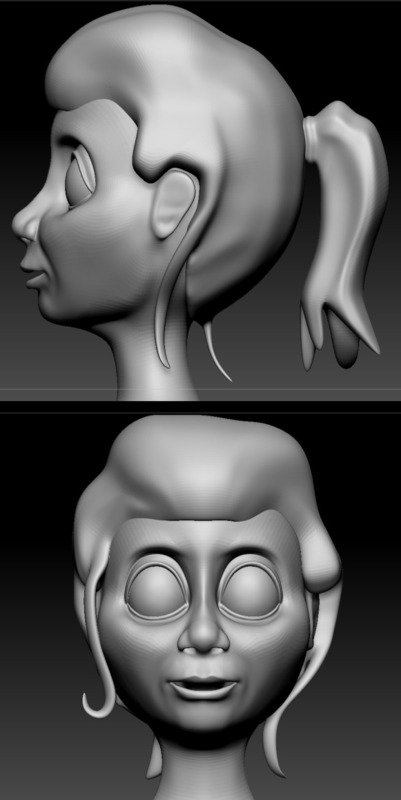 Then I started ZBrush sculpting. The sculpting on the pin cushion was pretty simple. I gave the body of it a few stitches and softened the top a bit so that it might look a bit like felt. The feather duster was similarly simple: I just drew a bunch of raised lines and then pinched them where necessary to give it a feathery type of texture. Because of the stretching I was forced to relax and unfold some of the UVs again, which moved them and made all of the normal map work that I'd already done irrelevant. I ended up altering the geometry of the base mesh a bit so that it would hold some of the sculpted elements better, fixing the UVs, projecting the sculpted detail onto the new mesh, and resculpting about 80% of the detail anyway because every finger had areas that had been pinched in the original sculpting that didn't project well and required multi-level smoothing which then erased sculpted details. Many of the details also projected a little less sharply than I desired, so I had to go through and refine all of them, even where I hadn't had to smooth things... Suffice it to say that it was tedious and dull and repetitive and I haven't attemptted to bake a new normal map for that piece again since I (hopefully) fixed the problems. Now I intend to move on to sculpting the face of the Juggler. I'll post the results of my efforts in a few days. This week I completed the first half of a task by the time of my first directed study session and the second half of the task by my second session at the end of the week, so I'm combining my updates into one single progress report rather than my usual two. I sculpted the Gecko's metal texture using the revised method that I described in last week's blog entry: a combination of ZBrush's Blob brush set on "spray" followed by a whole lot of hPolish. I used this method on all 113 pieces of the Gecko's body, the hammer, and the paintbrush and brought him into class for evaluation on Friday. I was told that he looked really good, and advised to make sure that when I got around to sculpting the detail of the hand that I didn't let its presence distract from the Gecko by being either to well or too poorly done. I sculpted the hand earlier today, and I think that I managed to find a non-distracting balance to its detail. It's presented with all of the major wrinkles, but I left off any finer surface detail. I'm pretty happy with how it came out and hope that it meets with my instructor's approval when I show it in class on Tuesday. Now comes a whole lot of exporting and importing and normal map baking, between which mundane tasks I shall continue to make progress on my Juggler, which I'm working on normal maps and ZBrush sculpting for at present.